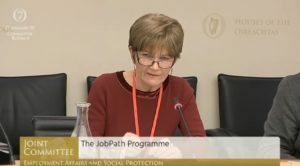 AEGAI Chairperson Catherine Greene spoke yesterday January 17th at a Joint Oireachtas Committee meeting on Employment Affairs and Social Protection. The committee was looking at Jobpath, the activation programme tasked with working with those who have been on the live register for 12 months or more and who wish to obtain full time employment/self-employment. Researchers from the Waterford Collaborative Research Cooperative reported very negative quantitative and qualitative findings from their study of 121 participants. Catherine Greene put forward disturbing examples from her own experience and suggested that Turas Nua seems to lack recognition of the trauma experienced by people who find themselves at a major crossroads in their lives and understanding of the challenging barriers such as childcare, transport, disability, illness, bereavement, addiction issues and mental health issues. She added that the forced match pattern of this recruitment model has been unsuccessful, with only 9% of participants securing longer term employment and pointed out that it does not align with the broader need of upskilling and social inclusion and the goals of Ireland’s National Skills strategy 2025. As highlighted by Cambridge Professor Tony Watts, the career counselling process is not only focused on finding people jobs but supporting people to become resilient and to construct their own career journey, and this is a very strong and important element of all of our adult guidance services. As evidenced by the numbers of people who successfully progress on through the support of the information and guidance professionals working in the adult guidance services, this is the process that should be used in the future development of the sector.